Would you like Team Sweetness to meet with you, your church, workplace or organization to learn more about MANNA Worldwide and how to get involved? As many of you know, Ben and I have been supporting MANNA Worldwide for sometime now. Our church (Heritage Park Baptist Church) funds an orphanage in the Gobi Desert through MANNA. Hearing about the work God is doing there each year has continued to stir our hearts. This past Spring, while having lunch with MANNA missionaries Ryan and Kim Jones, we were presented with the opportunity to join them on this 2018 missions trip to help teach the youth how to bake! The project we will be heading to on the 24th of January currently ministers to about 240 Burmese children by providing two meals a day and an education. Because they are refugees who's parents work in Thailand, they are not able to attend the Thai schools. 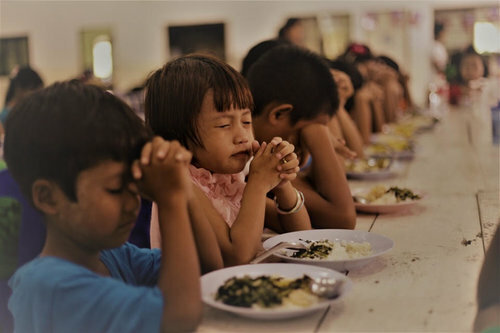 In addition to feeding and educating the Burmese children, this particular project is also providing 1 meal a day for approximately 80 Thai children. I believe sometime last year the facility received a donation to demo their previous kitchen and construct a commercial kitchen with the plan to teach baking as a trade skill...which is where we come in. While we are not teachers, we don't speak Thai, and we've never been on a missions trip, we just know God is going to do some wonderful work and we so very thankful to be apart of it. We will have the opportunity to do some manual labor like painting a soccer field for them, and also to love these children, play with them, help with meals, and of course teach some of them a skill that can better their futures. Because of many generous hearts we have dozen of shoes and several water filters we will be giving to the children and families we visit there. These gifts are a tremendous blessing and we can't thank you all enough for your support. If you hadn't heard about MANNA Worldwide until now, please visit their website to learn more. We look forward to sharing photos and videos.